With so many uses, does bleach kill roaches too? The simple answer is yes, it does. However, before you run off and start pouring that stuff everywhere, you need to ask yourself a very important question. Is it effective at killing cockroaches? The answer to that question is a big no. 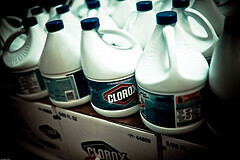 To kill roaches with bleach you either have to drown them in it, or get them to ingest it (as in have them drink it). Good luck getting them to drink bleach. Let’s pretend you don’t know what bleach is. Would you honestly be tempted to drink it from the smell? I know I wouldn’t and the roaches wouldn’t either. Sure, they’re stupid little annoying insects, but they’re not that stupid. In fact, that stuff smells so bad it will make them run the other way. With ingestion being impossible, the only way to kill these invaders with bleach is to drown them in it. Are you picturing dropping them in a cup of bleach? Well that’s one way, but can just soak them using a spray bottle. Get one of those cheap spray bottles for under a dollar, fill it up with bleach and spray them as you see them. The problem with that is you can only kill what you see. The thing with roaches is if you see one or two then there’s a good chance there are hundreds of others hiding in your house. You won’t be able to soak them all in bleach. That I can guarantee you (and guarantees are almost a never when it comes to getting rid of roaches). Another problem to consider is the very act of spraying bleach all over the place. It will discolor a lot of things that it comes into contact with. Get it on the carpet and it will be ruined. I’m sure I don’t need to tell you what happens if you get bleach on other things. There are better solutions if you’re looking to kill them with some sort of spray. Even a bottle of Raid will be a better option than spraying bleach. And for those of you who would prefer a more natural solution, I recommend a bottle of Eco Defense Organic Roach Spray. To kill off the roaches you must be able to hit most, or at least many of the others safely hidden from you. Bleach does not do this (Advion Roach Gel is the best at doing this and here’s why). It is probably one of the worst options for achieving this. Trying to get rid of roaches with bleach is like applying a band-aid to a severely infected wound; it doesn’t really do anything. There are many other options that are so much better at getting rid of these pests. Plus they won’t stain and they don’t smell quite as bad as bleach does. I’ve covered a lot of the more popular and effective options on this website here. Read through them and decide what is best for you. Now if you’re thinking you just want to use it to kill the random roaches you see running around the house, you have better options too. You are better going to store and spending a few bucks for a can of Raid, or something like it. It will do the same thing without the negative side effects of bleach. If you’re really intent on not buying anything, consider using a soap water mixture instead. Are you certain there are roaches actually nesting in the drain? Will it do more harm than good? This is important because bleach is corrosive and can damage your drain pipes. How is it any better than pouring a pot of boiling water instead? Because it isn’t. Boiling water does the same thing without the negative side effects. Although I recommend not pouring bleach down the drain, I can’t stop you. You will have to decide for yourself after considering the points I just mentioned. At the end of the day, the choice on what to use is yours to make. Do keep in mind that there are better options and bleach will not solve your cockroach problems if you have an infestation. If you’re looking for an effective contact killer, I recommend spraying with DemonWP instead. Otherwise, one of the most effective roach killer I have come across is the Advion Roach Bait Gel. I hope I have provided you with an answer to your question of does bleach kill roaches?